“Character Building: Restoration of Values”. Disciple – Monograph on T. Subba Row”. What is character and how to build it? This is the question before us. In human society, we find innumerable characters – some noble and some mean. While they are by and large inborn traits, our experience shows that they can be cultured and nourished. To understand the whole matter of character, we must first get into the principles that constitute and direct a human being. We have two sets of principles: the spiritual (those belonging to the imperishable ego) and the material (those that make up the ever-changing bodies or the series of personalities of that ego). In common knowledge, each human being is an admixture of Daiviprakriti (Divine Nature) and Dravyaprakriti (Material Nature). The latter is transformed into the former in consequence to the effort made in the direction of ‘regeneration’ or ‘transformation’. The spiritual principles are again three: Atma or the Higher Self which is the universally diffused ‘divine principle’, inseparable from the Absolute; Buddhi, the spiritual Soul, the vehicle of Atma; Manas, the conception of Ego-ship, the spiritual Ego and the radiant Taijasi . This Manas is the real Individuality when combined with the earlier two. This ego has originally incarnated in the senseless human form, unconsciously animated by the two again. We call this the “Causal body” overshadowing every personality. Karma forces it to reincarnate into, and is the one responsible for all the sins committed through, and in, every new body or personality. Through the long series of rebirths, it hides the true Individuality. To put it in simpler terms, the human being is a triad of Manas, Buddhi and Atma. The personality is fourfold: Sthula-sharira, Prana, Linga-sharira and Kama rupa. Kama rupa is the seat of animal desires and passions, the centre of the animal man. The line of demarcation between the mortal man and the immortal entity lies here. That which passes from personality to personality along the individual chain is the character. It is not a mere metaphysical abstraction but the sum of one’s mental qualities and moral propensities. Individuality partly manifests in any one birth and its “build-up of fragments” from all the births is the character. Justice, kindness and love make the character pure and noble, as against common weak traits such as selfishness, indifference and brutality, which make it mean and substandard. It must be constantly remembered that “all good and evil things in humanity have their roots in human character”. Character is too often conditioned by “the endless chain of cause and effect”. Here dawns the ray of hope for character-building. There is no evil per se in nature and it is only the human mind that creates the distinction. The application of the mind to the objects it comes in contact with makes the seeming difference. Pulled by the “lower” self, the actions tend to become vicious and perilous. Theosophy teaches the way to gradually get out of this trap. “The perversity of average human nature and its selfishness, always tending to the gratification of personal desires to the detriment of neighbors and next of kin”, is the common characteristic we see; and this we call the “social evil”. Ethical teaching and the attempt to make all see things “as they are” and as what one wishes them to be – is what all religions have talked about. Ethical teaching and moral instruction is available to men and women of the world since long. We see the dwarfing and even elimination of this code all over again. Restoration of these principles and inculcating the idea of “practicing the loftiest moral ideal” among all is needed. The work of the Theosophical Society is aimed at this. It tries to trace the philosophic base to these ideals and to explain the inescapable need to adapt them. For example, every religion tells people to be “good”, while theosophy places before the public the fact that goodness is after all a human quality that is derived from the divine concept. It explains how goodness alone survives and all standing in opposition to it eventually die down. The virtuous action in human life is derived from the universal principles and the concepts existing around them. Unity being the underlying principle for the manifestation, the concept of goodness means being good to all. Similarly all points of right conduct can be traced to their original source. Order is the principle, understanding becomes the concept and hence the discipline (learning) is the human action point. The same way, all the universal principles such as Harmony, Truth and Beauty are conceptualized and brought into being in day-to-day living. Theosophy also explains what would be the fate of the world if these qualities were not reflected in human character: ultimately all would turn into a chaos. We like to live in a cosmos and not in chaos. Thinking Man is the vehicle of the “manifested creative power” and the working system of the living beings makes the World at large. Developing the mental and other subtle bodies at our command and making them independent vehicles of Consciousness, active in their own world, is the key for harmonious existence. Constant remembrance of the fact that we are Monads, the divine sparks from the Supreme Power (Absolute) at the helm of affairs, enables us to be just, perfect and beneficent. There are many religions around the world. General opinion among masses is that the different religions differ much in their application. They are one against the other. Groups of religions quarrel with each other, and carry their differences to an illogical extreme. Wars were waged in the name of religion. But the fact found out by investigators of religions and thinkers of a wider perspective is that there is an Essential Unity among all religions; all have sprung from the One Source; differences are only apparent and not intrinsic. Emerging from different nations of the world, at different points of time in chronology, and from the minds ever evolving in understanding, the various religions have different terms and terminology. The Idea intended to be transmitted is the same. Religious ideas also depended and differed based on the prevailing socio-political-economic situation. Added on to this, inborn selfishness of the propagators of religions and the interpreters of the religious texts brought in much irrecoverable and irrelevant confusion to the human mind. Born and belonging to a particular religion, self-pride and feeling of superiority overpowered the minds of men to deride the other religions, to condemn and curse their ideas. Reconciliation of religions has become necessary, as also the restoration of the basic unity among them. Social reformation was undertaken by scholars from time to time, and such reformations have become separate religions eventually. As yet, the human mind has not soaked full in the spirit of oneness of all religious teaching. The deeply biased and prejudiced mind would not allow the ideas of reconciliation, synthesis and integration enter into it. Religion is only an outer cloak to the inner core of spirit. Oneness of all humanity is the basic teaching as we can see in the following texts, time honored and considered authentic. 1. Religious teaching, whatever be the name it assumes, is aimed at Peace and Prosperity among all citizens of the world; collective well-being is the common purpose. 2. The cause of atrocities in the name of religion is outside the religion and has nothing to do with it. The term ‘religion’ is used for public consumption only but the root is in the hatred and animosity allowed to grow and get crystallized in each human heart. 3. When purified of the dross of human dogmas, the pure essence remaining will be found to be identical. Religious ideas or philosophic statements need to be user-friendly, if they are to be applied to everyone’s daily living. Human being is constituted of various forces (energies): magnetic, sympathetic, antipathetic, nervous, dynamic, occult, mechanical, mental etc. The physical forces are all biological in their essence; they intermingle or often merge into intellectual and moral forces. Intellectual forces are the bodies (vahana-s) of the moral forces. A force is “moving matter” or “matter in motion”. The cosmos is built upon certain universal principles and they are translated eventually into human actions. It happens to be the responsibility of each one of us to understand this derivation and to see that right application of the value system takes place. Human being is made of the same characteristics of the cosmos and he should reflect and represent them without any distortion. For various historical and geographical reasons, briefly indicated above, this has become disoriented and the restoration is not an impossible task, if we are mindful of the continued sustenance of the Earth planet. As the environmentalists and biologists say, we must become capable of “Thinking globally and acting locally”. Restoration of values inevitably accompanies our behavior in the right perception of things around. Living a life in strict consonance of the Eternal and Universal principles without any mental reservation or equivocation is the key, and this is always available to us. 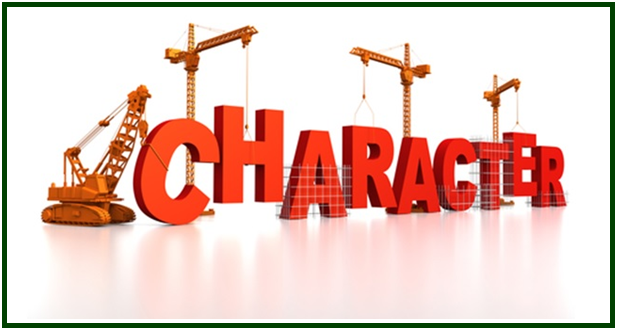 Readers are invited to see the article “The Mystery of Character”, by Steven H. Levy, M.D., which can be easily found in our associated websites.